An easy recipe for eggless strawberry banana muffins. 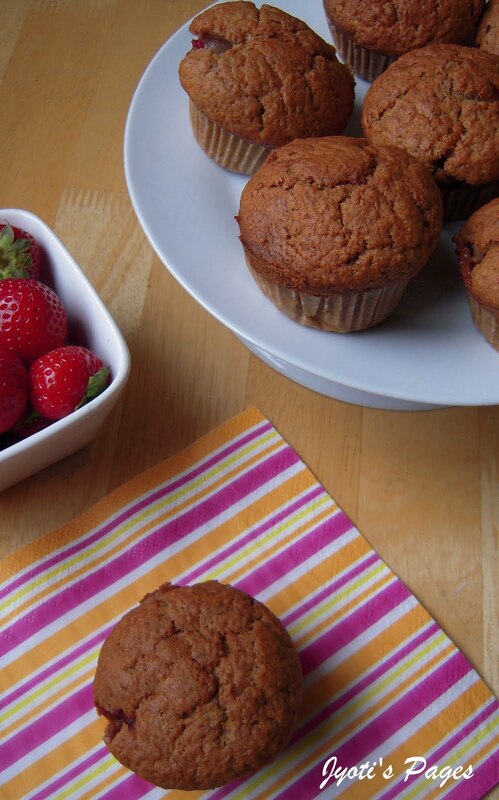 These muffins are full of flavours and are a great accompaniment to a cup of coffee. I am really excited to be able to participate in the August Sweet Punch. I hope it is going to be a regular affair on this blog from now on. 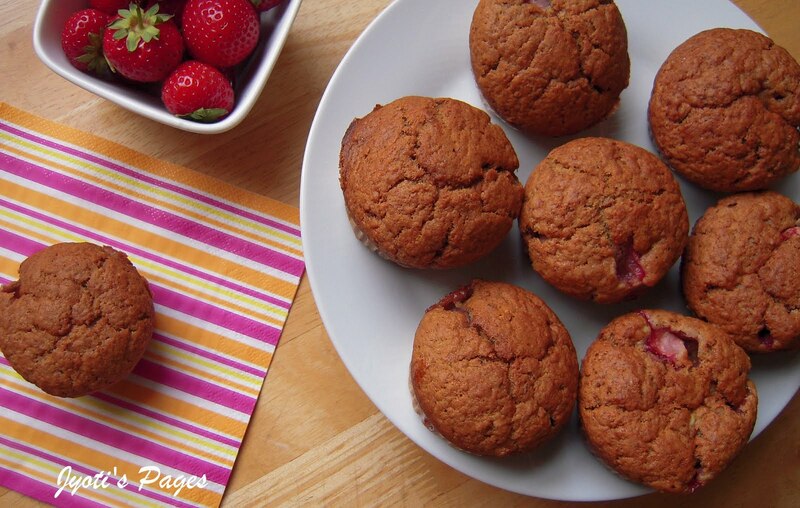 This month Ria chose Strawberry Banana Muffins from the Joy Of Baking site. To tell you the truth, I was a bit apprehensive about the combination of Strawberry and Banana. I have used bananas in making chocolate cake. It has a mild banana flavour but I was not sure how I would like a prominent banana flavour muffin. So, I went for making a small batch and hence halved the quantities as given in the original recipe. Also, I had to make it eggless. The results were good and I really enjoyed the moist flavourful muffins. 1. Preheat oven to 180 C. Place the oven rack in the centre of the oven. Line the muffin pan with paper liners. 2.In a saucepan melt the butter and let it cool down to room temperature. 3. In a medium-sized bowl whisk together the yoghurt, water, baking soda, vanilla extract and mashed banana. Add the melted butter and stir to combine. 4. In another large bowl combine the flour, sugar, baking powder, baking soda, cinnamon, and salt. Gently fold in the berries, making sure they are coated with flour. 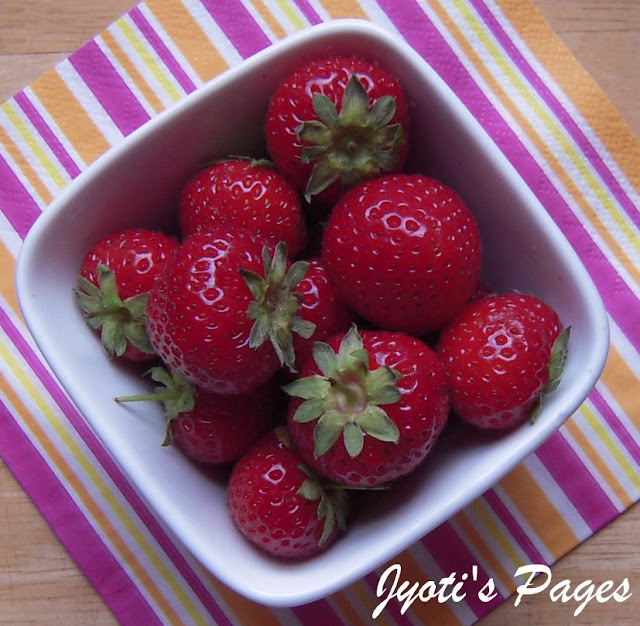 (This helps to prevent the berries from sinking during baking). 5. Add the wet ingredients to the dry ingredients and stir only until the ingredients are just combined. Do not over mix the batter or tough muffins will result. 6. Divide the batter evenly among the muffin cups using an ice cream scoop. I got 9 with these measurements. 7. Place them in the preheated oven and bake for about 20-25 minutes. They are done when a skewer inserted in the middle comes out clean. 8.Transfer to a rack and let it cool. Enjoy with a hot cup of coffee. Loved the colour of your muffins..
Muffins look awesome dear. Perfectly baked. Love eggless baking. Such pretty muffins! And yogurt is a great sub for eggs - Im sure they were moist and yum! Havent come across a banana and strawberry combo till now. The muffins look yummy.i miss baking so much ! Lovely colour and fabulous looking muffins. Excellent work!